Add a beautiful accent and timeless elegance to your home décor with an elegant clock from Weaver Furniture Sales. 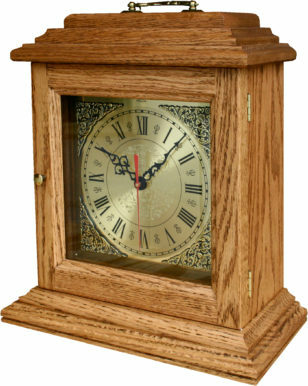 Choose from our wide selection of wall, mantle, cabinet and grandfather clocks. Skilled Amish craftsmen painstakingly craft each clock. And they use solid Midwestern hardwoods. Like oak, cherry and maple. Plus, they insert top-quality movements. So browse our online collection of handcrafted clocks. Or visit our ‘brick and mortar’ store in Shipshewana, Indiana. Because you’ll find exploring the clocks in person will be time well spent. The clock you choose for you home should enhance the ambience of the room. Fortunately, we have a selection that’s wide and varied enough for you to do just that. Because we offer timepieces in a variety of sizes, styles and designs. So you can choose the classic Mission. Or, you can go for the elegant Whittington or the timeless Canterbury designs. What’s more, you can select from a plethora of custom options. Like wood species, stain/paint/dye as well as hardware.